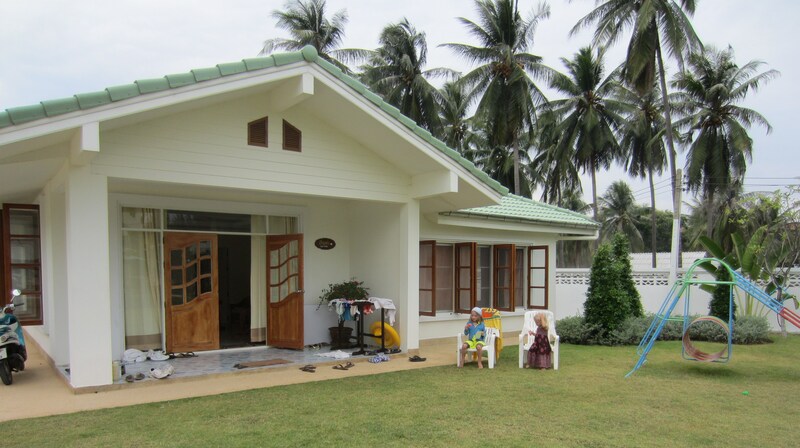 In Thailand, we stayed at The Juniper Tree which is about 3 hours south of Bangkok. It is located on a quiet stretch of the Gulf of Thailand. It caters to missionaries and their families; accepting only donations for room/board. We stayed in a 3 bedroom cottage. Outside our front door was a grassy playground and a pool. The pool was somewhat scary since there was no gate. But we didn’t lose any kids. Beyond the pool was an exercise room, a kids activity/video room, dining hall, and then the ocean. We were served a yummy breakfast with french press coffee, fresh fruit, eggs, and assorted goodies. Lunch was a Thai meal. Dinner was western style food. Ice cream, coffee, and tea was available all day! Norah made friends within hours of our arrival. Here she is with her twin from Sweden. I bet you can’t even tell them apart. I loved that it was ok for kids to be kids. The missionary kids were free-range indeed! More free-range than I’ve ever witnessed in America. When they finished eating, they left the table to play while the adults talked. 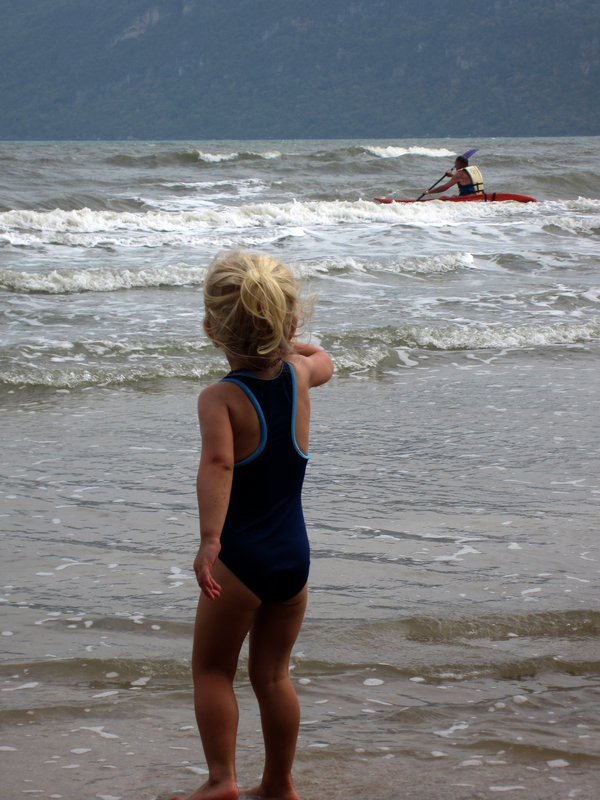 I wasn’t quite ready to send Norah to the beach by herself but I probably would have gotten there with a little more time around these families. 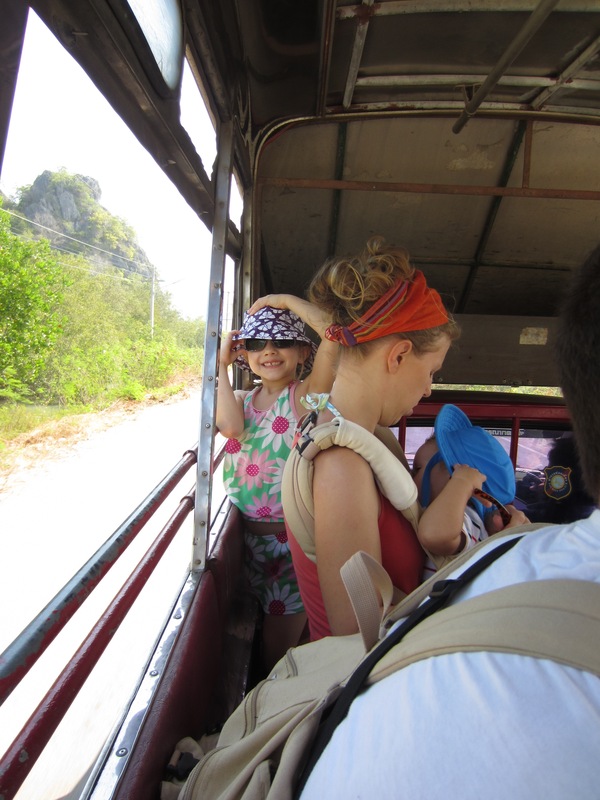 We traveled by song tau to Khao Sam Roi Yot National Park. A song tau is a pick-up truck with benches in the back and a metal covering. Super cheap and fun transportation. 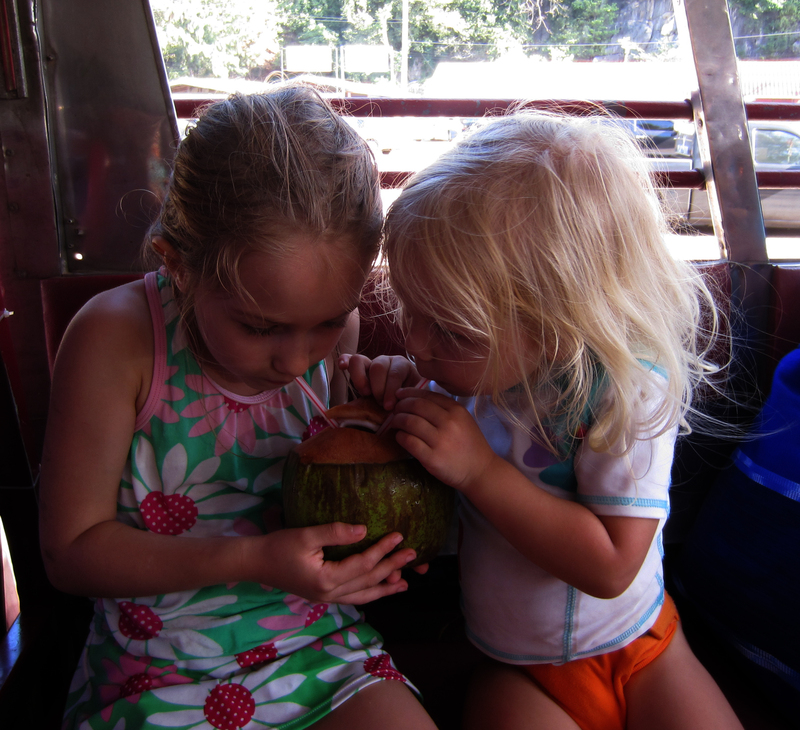 The girls adored the lack of carseats or seatbelts. 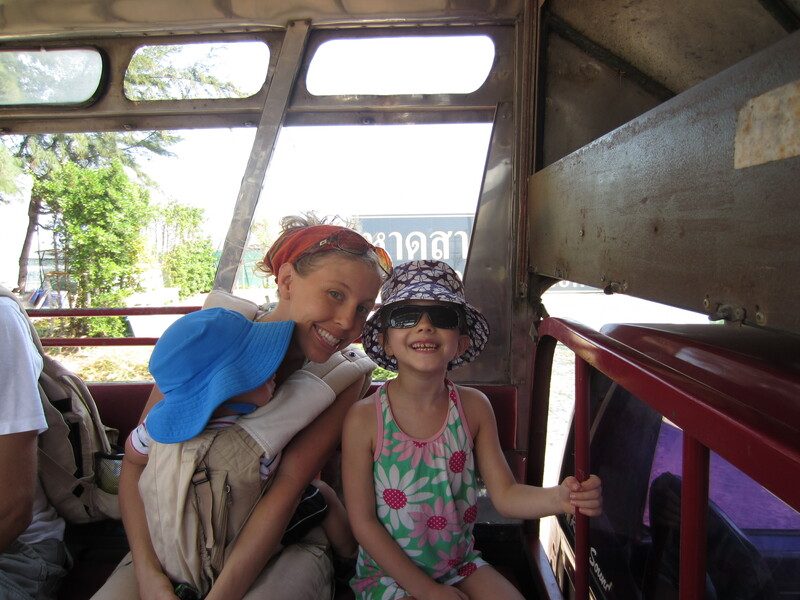 And I witnessed Noelle nurse on a song tau, fishing boat, tuk-tuk, plane, elephant. Ok, I’m just kidding about the elephant. We didn’t ride any this trip. The national park was lovely. The name translates “mountains of 300 peaks.” We climbed and climbed, saw monkeys, played in the sea, took a boat ride, got really dirty and sweaty. Asher and I napped on the beach while Noelle and Zach went caving for an hour. At least that is what they said they were up to. We ate food that I thought was a little sketchy. Oh, and I threw a stick at a dog that was looking at me funny. Then I had to search around for another stick because he was still looking at me funny. Lesson: don’t throw your weapon. Especially if you’re going to miss. In our leisurely moments (which was all the time! ), we played. Scott kayaked in a crappy, beat-up rental. It cost like a dollar to rent the thing. And we rented a moped to scoot about when we could escape the kids. See, if I’d fully vested in that free-range thing, we’d have just left them to their own devices! We also fell in love with Blue Beach, an outdoor restaurant down the road. They served the best Thai food with mostly organic ingredients. And they served alcohol, had wi-fi, and toys/bikes/rabbits/koi pool for the kids. So we opted out of a few meals at Juniper Tree to splurge on Blue Beach. There was one disaster. Asher got a zhu zhu pet stuck in his hair. After many tense moments and screaming, he was left with a bald spot. I don’t iron. I don’t. Don’t judge me. Next up, either the Thai tooth fairy, or cloth diapering away from home, or traveling with kids. Not sure which I want to tackle next. Posted in Family, Food, Play and tagged dolphin bay, thailand. Bookmark the permalink. Glad you had a great time in Thailand! You are too kind. And your pun is beautifully crafted. But that dust ruffle was forgiving around the pleats. I have now officially nursed my baby while riding an elephant in the mountains of Thailand…and I have pictures to prove it! haha! HI…I am looking into going to the juniper tree in April. I was thrilled to see your blog, it sounds like it will be a good time. did you find the 3 bedroom cottage was large enough? We have three teenage boys and a set of in-laws. Do you by chance have any pictures of the inside of the cottage? I don’t have any indoor pics that would show much but we found it spacious enough. We had six adults and three kids! Each room had its own bathroom with shower. And each room had a double bed and one or two twin beds. The sitting room was a good size and opened to the patio. There was an a/c option in each room as well for a small fee. Oh, and they included an electric kettle with supplies for tea. And a large bottle of filtered water. I hope you enjoy it as much as we did! My sister is there now and says it hasn’t changed. But be sure to eat at Blue Beach down the road!